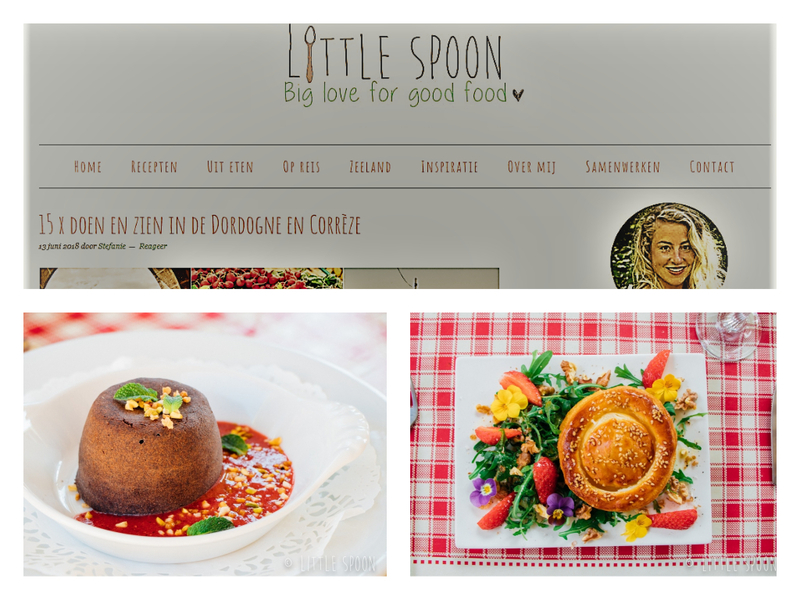 A big thank you to the latest article from Stefanie VAN DER MAAS, popular blogger from the Netherlands which we had the pleasure to host arranged by the Department of Tourism of Dordogne…..
We beginnen de kookdag met een bezoek aan de lokale markt in Le. Dit is een markt om van te dromen. Hier wil ik ook elke week mijn boodschappen doen. Chef Ian is geinspieeerd door zijn buurvrouw van 69. Zij vindt dat je meer tijd moet besteden aan het kopen van ingrediënten en minder aan koken. Lokaal winkelen en uit het seizoen. Zoveel meer smaak We koken verse geitenkaas bij Jérôme. In de lente is deze kaas op z’n best dankzij het verse groen gras wat de geiten eten. Chef Ian legt ons van alles uit. Over lokale producten maar ook wat je met elk stuk vlees bereid. Op de markt is bijna alles lokaal. 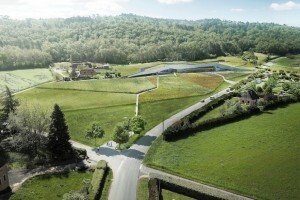 What do an award-winning author, our cookery school and the Dordogne all have in common? Well, you’ll just have to read Martin Walker’s newest novel ‘A Taste for Vengeance’ and find out! If you haven’t heard of the Bruno series, you’re missing out. Martin Walker, touted as an Ambassador for the Dordogne, fell in love with the region back in the 1990s and started writing crime novels which are set in the area. Martin Walker worked for many years as a foreign correspondent for the Guardian as well as editor-in-chief of United Press International. Drawn to the wonderful Perigordine gastronomy, wine and history, Martin splits his time between his home in the Dordogne and in Washington DC. Inspired by the Perigord, he published the first of the Bruno series in 2009 with Death in the Dordogne: Bruno, Chief of Police. Bruno, the protagonist of his stories, is actually inspired by a true person – his friend, tennis partner and of course, local village chief of police. The books have now been translated into 15 languages and draw many visitors worldwide who are keen to hunt down Bruno’s haunts! 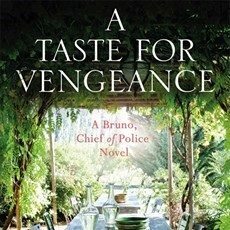 His latest book, Taste for Vengeance, is due out in June and is the 12th in the series of Bruno crime novels. The plot involves Bruno – the local chief of police – helping his friend, Pamela, to teach some classes at her new cookery school in English. A participant in the course goes missing, is eventually found dead and a murder hunt ensues. You’ll have to buy the book to find out how the story unfolds! Can you guess where Martin Walker carried out his research for his latest book? You’ve guessed it! Our award-winning cookery school served as the basis for much of his research. Don’t worry though, you’re in safe hands at CookDordogne – no murder mysteries here! A “milestone birthday” celebration in May for my friend, Ginger, found us in the Dordogne region of southwest France. This rustic, and fertile river valley deserves its reputation as the soul of French cuisine. The region’s gastronomic treasures include truffles, walnuts, goat cheeses and all manner of duck delights. In addition to taking in our share of castles and prehistoric caves, we visited local farmers’ markets and ate our way through memorable meals from the most humble menus to Michelin-starred affairs. All very satisfying! Now it’s getting hot out there, and many of us dread the thought of firing up the oven. I get it. 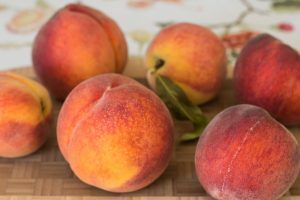 This recipe is a no-cook, no-fuss option that’s brimming with fresh, seasonal peaches. It’s satisfying without being cloyingly sweet or rich. As a matter of fact it’s mostly peaches, frozen and whizzed up with a dollop of crème fraîche and a bit of sugar to taste. Three ingredients. Done. 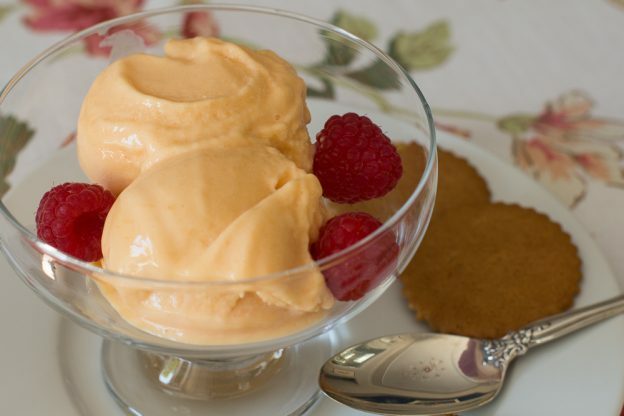 I’ve been making a version of frozen fruit ice creams and sorbets for a while. It was an easy adaptation from making a too-thick fruit smoothie just once, and preferring the semi-frozen texture over a slushy one. Improve the texture, add a bit of sweetness and voilà – dessert! Imagine my delight whilst enjoying a day-long market tour and cooking class at CookDordogne at Le Chevrefeuille in St. Cyprien, France; when Chef Ian Fisk included a banana ice cream recipe using the same technique. (He uses a commercial-strength food processor.) His unique twist uses crème fraîche (we were in France after all), and of course he also amps up the flavor by including vanilla beans. He’s “chef-y” that way, and will tell you so himself, with a wink and a grin. Side note: Ian and Sara Fisk live here with their family. It is charming and I highly recommend staying here as your base when traveling in the area. Sara Fisk’s deft hand with accommodations assures your comfort. Finding it hard to find the perfect gift? Look no further, simply buy a cookery course voucher for a days cookery course experience in the Dordogne which your loved one can take up any Sunday or Tuesday throughout the year at his/her leisure. It began, like most good cookery classes, in a market. And as we were in the market town of St Cyprien in the Dordogne, this was to be a seriously foodie affair. Before deciding what to buy for our class, our host Ian Fisk first wanted to show us the diversity of local produce, especially now, in the third week of September, at the height of the harvests and just days before the grapes were to be picked from the surrounding vineyards. Glossy vegetables, from red and yellow tomatoes to pumpkins, squashes, green and yellow courgettes, raspberries, figs and much more were piled neatly onto tables groaning under their weight. Mushrooms were having a moment, too – morels and ceps were plenteous; this was just before the truffle season and high demand meant prices were expected to reach €500 a kilo. On to meat and the choice of sausages from just one supplier included pork mixed with duck, venison, wild boar, blue cheese, hazelnuts, figs, walnuts, ceps, peppers and pimento. Another producer had arranged his stock of plucked quails, pigeons, poussins, older chickens for roasting or coq au vin and skinned rabbits in size order. If, unlike me, you like foie gras, this area will be heaven to you. If like me, you are not a fan for both ethical and taste reasons, you might want to look away now, because along with superb wines, the area specialises in fatty liver – and how. So fatty, in fact, that the stall with the birds also displayed fatty livers for frying. Enormous, roughly the size of the quails, yellow and, as Ian explained, never to be eaten raw. Plenty of stalls specialised in foie gras – at least it’s true to say that apart from the bill every part of the duck or goose was used. Jar after jar and tin after tin of foie gras, duck breast and legs prepared every which way were being snapped up by local people who couldn’t get enough of the stuff. We saw it on every menu, even served with burgers. One foie gras producer invited me to visit her farm and help “stuff the duck”. Needless to say, I passed. The region isn’t known for its cheese, but Ian recommended walnut Trappe cheese, made by monks, with an edible brown rind, which I bought to take home, and goats’ cheese for our class – we chose crotins that were one and eight days old direct from the farmer. Jars of honey included acacia, chestnut and sunflower, and this was the time for just-bottled homemade vin de noix, made from fresh walnuts grown along the Dordogne river and in the hills of the region. This fortified wine tastes a bit like port with nutty notes, and like port it keeps a long time. Homemade walnut and chestnut tarts were also available to buy. 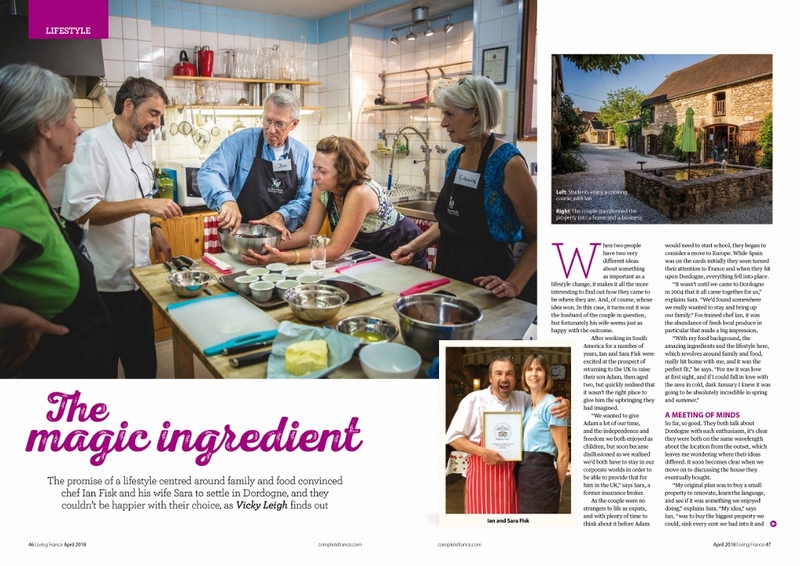 After selecting our produce, we drove to nearby Le Chèvrefeuille COOKDORDOGNE cookery school, where Ian, who trained at Le Talbooth on the Suffolk-Essex border, and his wife Sara have a Perigordine farmhouse with 13 bedrooms including five guestrooms, plus outbuildings with two gites for rent. Throughout the summer, Ian cooks evening meals for guests and runs a cookery school in the day. Ours began with everyone given a job and Ian showed the patience of a saint as we chopped olives and mushrooms, diced chilled butter, cut out pastry, prepped green beans, whisked melted chocolate and cream, over all of which he waved a cheffy wand and a form of food alchemy was created. Before we knew it, lunch was served in the sunny garden and comprised a tapenade, the most intense mushroom velouté made from ceps and a real stock; a salad of tomato, avocado, wild rocket, buffalo mozzarella and smoked duck with heaps of homegrown fresh basil; goats’ cheese tarts served with rocket, poached figs and sliced almonds with a balsamic dressing; and dark chocolate fondant puddings with a foolproof melting interior, an intense strawberry coulis and fresh cream. All served, as everything in these parts seems to be, with a few bottles of Bergerac. It may not have escaped the alert reader’s attention that Ian and Sara are English, and on our travels we met a fair few British people with successful businesses here. Part of the reason Brits move to the Dordogne, along with the natural beauty of the landscape and the great quality of life is history. 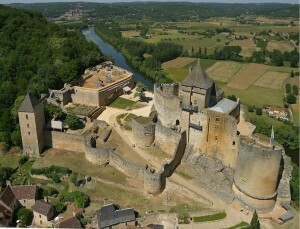 With this in mind we drove for just 10 minutes to Château de Castelnaud, which was owned at different times during the Hundred Years’ War by British lords and is perched on the top of a hill like something from The Lord of the Rings, with magnificent views of the river and surrounding countryside. The castle was renovated in 2005 and has a museum of medieval warfare, filled with gruesome weapons that make you glad you weren’t around in the 13th century, together with suits of armour, a blacksmith’s workshop and a kitchen – perhaps the only one in the area without foie gras………………………………. Direct flights from London go to Bordeaux and Bergerac.